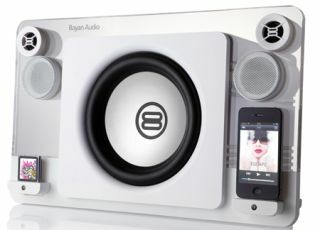 Bayan Audio StreamPort adds wireless aptX Bluetooth to iPod docks | What Hi-Fi? Bayan Audio has released the StreamPort wireless adapter, bringing Bluetooth aptX wireless streaming to Bayan's range of music systems. The new adapter connects via the 3.5mm input on the back of any Bayan iPod dock, though a universal StreamPort for any music system is in the pipeline, too. Bayan Audio's iPod docks caught our attention earlier in the year for offering dual iPod docks, allowing you to easily dock, charge and play from two devices (play one at a time, kids). The Bayan Audio StreamPort uses the new Smart Bluetooth 4 codec. This latest version claims to be more power efficient, more stable for streaming and also, thanks to the 'Smart', capable of connecting to new devices such as heart-rate monitors and pedometers. For now we're more interested in the aptX capabilities, which will ensure any compatible device, such as the HTC One X or Samsung Galaxy S3, should deliver superior sounding wireless Bluetooth audio. The StreamPort has a range of up to 15m, can connect to up to two devices, and works with any Bluetooth device, such as the new Apple products, which of course won't dock with existing Bayan Audio docks, due to the new Lightning adapter. The Bayan Audio StreamPort costs £30, and you can read our review of the Bayan 7 dock here.